There’s an unspoken rule in Utah that locals never pay retail. Actually, we pay retail on a lot of things, a little less on others, and rent a storage locker to hold it all. Everyone is a professional shopper here. It’s not that we forego buying gear at slopeside stores. We just know what to purchase where and when. Rental “demo” skis and boots begin to go on sale in late-March (ski clothing a bit later giving you another reason to visit Utah in summer). Resorts and stores turn over their entire inventory every season or two. Make an offer if you really like your rentals, especially if it’s late-season. I bought a pair of Rossignol Soul 7 skis with bindings for under $200 one July. Pro Shopping Tip: The shortest “men’s” skis (same ski, different design, i.e., Soul 7 = Savory 7) are often in mint condition making them a great deal for petite women. Reserve rental gear in advance online at local stores, such as Christy Sports or Ski ‘n See. They almost always offer discounts for doing so and even have slopeside stores if you need adjustments or want to swap them out. Consignment stores are plentiful, especially in Salt Lake City, and it is where all the locals buy their gear. I think 2nd Tracks Sports is my hubby’s favorite store; mine is still Tiffany’s, I’m afraid (which might explain why his is the discount shop). The Gear Room is another. Just Google for more. I know folks who buy consignment gear when visiting and consign it back before they leave. Outlet stores, such as Columbia in Park City, are fantastic for quality ski clothing at an affordable price. Buying ski gear in person from people who know it and know how you’ll use it is the best. Test: If you don’t know what a DIN setting is, then you probably shouldn’t buy skis and bindings online. However, online stores from Backcountry to Sierra Trading Post to Ebay to Amazon are fantastic places to shop if you know your size and what you want. Pro Shopping Tip: Backcountry.com has its warehouse retail store minutes from the airport allowing you to talk to the experts and pick up everything your heart desires for a great price on your way to the slopes. In December, Costco in Salt Lake City is another great place to pick up gloves, ski pants, snow boots, hand warmers and other items for a fraction of the price in specialty stores. Last time I looked, kids ski pants were $16. Wal-Mart is another one to check. This is not a secret around here though, and the gear flies off the shelves. Call first to check. High-priced long underwear for kids is a waste of money, I’ve concluded. Buy them cheaper, long underwear-style pajamas instead. Even if they’re cotton, the kids are usually fine. They usually don’t ski hard enough to really sweat and get cold. They’re heading for the hot chocolate long before that. The dual use is a bonus. Pro Shopping Tip: Lululemon capri tights on sale, of course are my new dual-use favorite under ski pants. I like the compression, and the shorter length doesn’t interfere with my boots (no, don’t put long underwear or anything else other than your socks inside your boots) while keeping me toasty. SkiMums constantly chat about where to find the deals while riding on the lifts. Big surprise! Feel free to share your favorite haunts below. For 5th and 6th graders, there is NO BETTER DEAL than the SkiUtah Passport, which gives 3 lifts tickets PER RESORT (42 days!) to 5th graders and 1 lift ticket per resort (14 days) to each 6th grader for just $45 (even less before January 31st). You must purchase this online in advance. Allow a couple weeks depending on time of year. Buy a season pass. Before you scoff, check out the early bird deals at various resorts and SkiMum Richelle’s post about economies of scale. For example, the Family 4-Pack at Snowbird (2 Adults, 2 K-12 kids) purchased in early August 2016 was $1999 and came with great lodging deals, Wasatch Benefits, which included Mountain Collective (half-off at a list of resorts worldwide; I use it at Jackson Hole), 3 lift tickets for Alta AND 3 lift tickets for Deer Valley for all four people plus other goodies like rental, clothing and food discounts. If Alta is typically $96/day (adults and kids over 12) and Deer Valley is $128/day (adults), the math looks pretty good for a week long trip and makes it easy to come back for a quick weekend or two! Note that there are some blackout dates on the Wasatch Benefits lift tickets (but you’re not skiing during those pricey times anyway, right?). The Epic Pass is another unlimited, very budget friendly option that will put an adult on the slopes of Park City resort and all other Vail-owned resorts for just over $800. No, you don’t need to create a spreadsheet to figure all this out, but it’s a great way to get the hubby involved, I’ve learned. If you have a friend skiing the same resort another time during the season, consider doubling up on transferrable pass or punch card. You can buy a transferable 10-to-Share Card at Snowbird (there are others available at other resorts), use a few days and leave it for another friend or relative to when she visits. At $589 (chairs only; $689 with tram), this worked out to $59/day. It’s even cheaper during early bird pricing. Just make sure it’s a transferrable pass. There are no, none, nada discount lift ticket in Park City stores. So, find them elsewhere. Salt Lake City ski shops – even grocery stores – have discounts on lift tickets but not always for all resorts. Call ahead or look online to check on discounts for Park City and Deer Valley resorts, in particular. Locals Tip: REI is on the way to Park City from the SLC Airport, has discount lift tickets, ski rentals and great gear, and all the money you spend goes toward your co-op rebate. Cha-ching! Some resorts, including Snowbird, have great advance purchase deals online, and if you’re visiting someone who has a season pass, they likely can get a Friends & Family discount at the lift ticket counter for you. Locals Tip: Deer Valley, which caps the sale of tickets, will offer advance purchase (but no discount) the day before. On a powder day, this is key. Package lift ticket deals are around, including the Salt Lake Super Pass, that gives adults lift tickets for 7 out of 14 days for all four Cottonwood Canyon resorts (Alta, Snowbird, Brighton, Solitude) for $540 ($78/day). It also comes with a number of other lodging and rental discounts. Liftopia has discount lift tickets for the resorts, but you have to choose your dates (guaranteeing that your kid will be sick or winds will close lifts on that day). Great deals, but choose carefully. Any other deals? Feel free to share them in the comments section. Park City and Deer Valley, generally, command the highest rents. However, the price drops and availability rises in nearby Salt Lake City (Alta, Snowbird, Brighton, Solitude), Ogden (Snowbasin, Powder Mountain) and Provo (Sundance). You can even sleep in Salt Lake and ski Park City (Foothill Blvd to Kimball Junction is typically a 16 min drive on I-80, enough time to enjoy your morning cup of coffee), or consider staying and skiing at other top-rated resort areas. If you like the terrain at Park City, then check out Snowbird or Brighton. If you like the food at Deer Valley (and who doesn’t), then look at its sister, Solitude, or the scrumptious Snowbasin near Ogden. All of these are less than an hour from SLC International Airport, have a distinct terrain and feel and are all popular with locals-who-know. The best part of Utah skiing is that you can ski any and all of them regardless of where you’re staying. It’s like being able to go to Disneyland AND California Adventure AND Newport Beach (with less traffic). So, think strategically as well as ecominically. Expand your search beyond ski-in/out accommodations. The convenience may not outweigh the cost, and traffic and parking are not really issues at Utah resorts. Hyatt Place and Residence Inn in Cottonwood Heights will get you to Snowbird, great restaurants or even a Utah Jazz game in less than 20 minutes. AirBnB and VRBO are great ways to find terrific homes and condos for a non-hotel price all over the region. Live like a local. You’ll spend less, have a terrific time and probably consider buying a place here. You wouldn’t be the first to visit for a week and leave with a second home as your souvenir. Prices vary greatly depending on the date. High Season pricing includes: Christmas, MLK Weekend, Sundance Film Festival (some resorts) and President’s Day Weekend. Avoid these to spend less. Typically, there is more availability at lower prices the week before or after each. Unless the kids are in high school (when it’s just too complicated), just take them out! No one fails kindergarten, and you can use the savings for college. Locals Tip: Sundance Film Festival raises the rates but empties the slopes all over the Wasatch. Visitors are inside watching flicks. It’s when locals ski Deer Valley bringing to mind the Caddy Day scene from Caddyshack. OK, that might be a stretch. Bottom line: Stay in Salt Lake and ski Deer Valley or whoever has powder (locals bookmark the Wasatch Snow Forecast to see where to go) that week. It’s time to blow some points! If you have a credit card, then check whether it has a points program. If so, you may be able to apply them toward a stay at a hotel near a ski resort. Between Park City and Salt Lake, most major hotel chains are represented and, many have luxury and budget options to choose from. For example, if you are eligible for Hilton points through its loyalty program or through a separate credit card, you might be able to apply those points toward a night at the 5-star Waldorf Astoria at Park City resort or to an entire stay at its more-affordable, Hampton Inn, just two miles away. Marriott and others have vacation rental properties (timeshares) that aren’t being used and are offered just like hotel rooms to the public at terrific rates. For Marriott, simply search its hotel website with locations and dates, choose list view and look for the Marriott Vacation Club logo next to the property. Most of these are one and multi-bedroom condos. More room, less expensive, great location. Perfect! It’s time to ski! 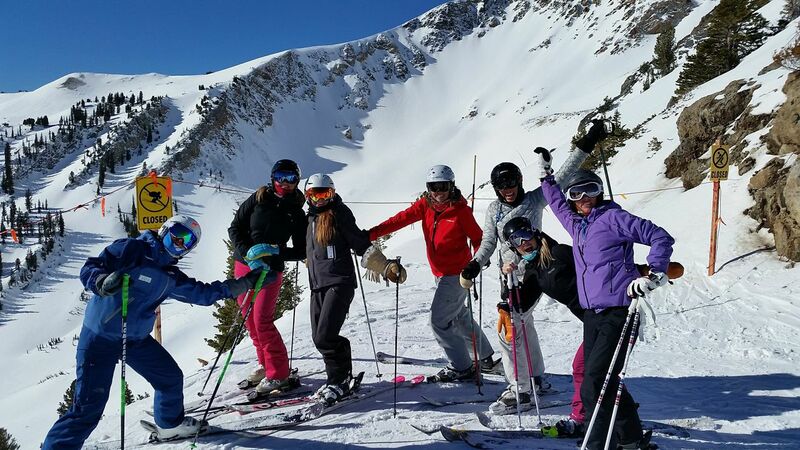 Starting January 6th, Intermediate-Advanced women skiers will head to Snowbird on Wednesdays at 9:30am. For the first time this season, however, we’ll start with the super-popular FOUR FREE GROUP LESSONS by Susi and The Mountain School. Then, in February, we’ll just meet and ski. No agenda. We ski until we have to leave. For some, that’s 10:30am, others it’s 3:30pm. If the weather is crummy (winds 20+mph or sketchy viz), then we pass. It’s just not fun to ski in those conditions, and WE LIVE HERE. There is no scheduled end date. Last season, we just took off our ski boots and put on our hiking boots and played throughout the summer. IF YOU ARE A SNOWBOARDER, please leave a comment on your RSVP. If there are enough BoardMums (we need a better name), we’ll ask very nicely whether The Mountain School can get an instructor. IF YOU DON’T KNOW WHAT YOU WANT OR AREN’T SURE HOW TO START, contact Susi Muecke at The Mountain School, our incredible Instructor, Sherpa and Friend to see what you need to reach whatever goals you have. Happy Holidays, Skimums! See you on the slopes. Ski ‘N See would like to invite you to use their demo skis (FOR FREE) from their Cottonwood Arcs location next Wednesday, February 25, 2015. They’ve got everything from Powder to Carvers to All Mountain skis for you to try out. It will be a great day to shred on the new skis you have been envying this season. Please RSVP to josterloh@skinsee.com by 5:00 PM Monday night. Their supply is limited, so if you are interested make sure to RSVP now so you are not waitlisted! Can’t wait to see you all next Wednesday shredding on some new sticks, it will be a great time!